San Jose, Costa Rica – May 1, 2017 – Turns out the real star of the online poker world is Americas Cardroom. The US-facing online poker site hosted its biggest-ever Million Dollar Sunday tournament. The event, which came with a $1 million guarantee, boasted a final prize pool of $1,372,000. The Million Dollar Sunday was the Main Event of the Online Super Series. It was the second leg of the currently-running OSS Cub3d. It is a 3-part online tournament series. The series features $5.7 million in guarantees, a number that will be far exceeded thanks to ACR’s thriving community that keeps prize pools large. Last night’s tournament ended with a 4-way final table deal: BluckBlucka ($150,543), PokerTrader77 ($146,061), RiskedUnderO ($141,089) and Oldflat ($141,048). The four continued to play for the 1st place title and $20,000 on top. PokerTrader77 left the table as the champion, driving his total win to $166,061 and earning him the Million Dollar Sunday sterling silver bracelet. 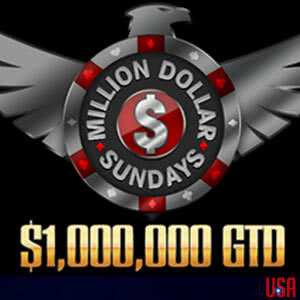 The first Million Dollar Sunday took place in February of 2015 and came with a $100,000 overlay. There were six more $1,000,000 GTDs that year, all of which resulted in overlays. However, Americas Cardroom continued to host the tourneys and build up its community. Yesterday’s record-setting Million Dollar Sunday should come as no surprise to anyone following the OSS Cub3d. The series has featured no overlays, a trend that looks likely to continue with the BOSS, the third leg set to get underway on Wednesday, May 3rd. The series culminates with a $750,000 guarantee this Sunday, a number that could very well exceed the $1 million mark. More details on the OSS Cub3d can be found at AmericasCardroom.eu. Americas Cardroom joined the Winning Poker Network in 2011. The Winning Poker Network has one of the longest and trusted online names in the industry and has been in existence since 2001. Americas Cardroom accepts players from the US market and the rest of the world. Rated first place for payment processing and cashout reliability repeatedly over the last few years, Americas Cardroom offers outstanding customer service and a friendly environment for all poker players around the world.